Upper Devonian: fig. 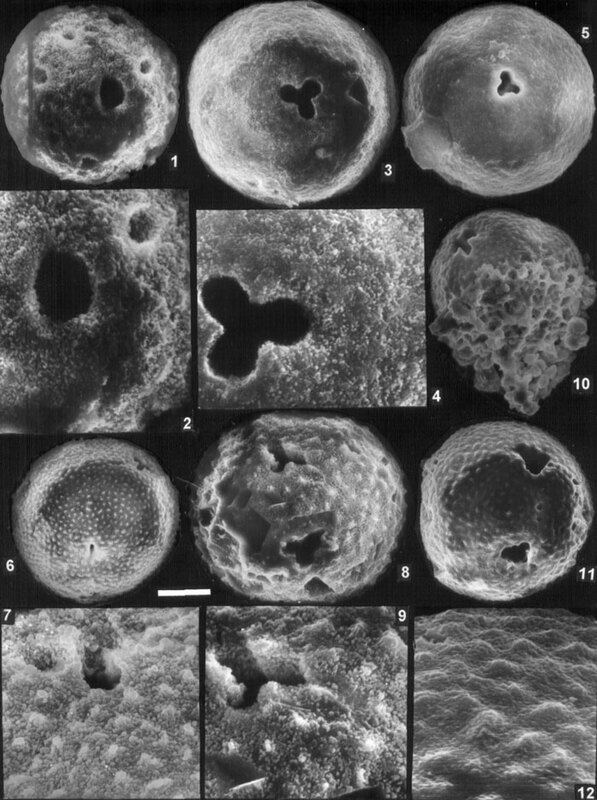 1-4, 6-9, 11, 12 - Middle Frasnian, Domanik Formation; fig. 5, 10 - Lower Frasnian. Borehole Shuda-Yag-1003: fig. 1-4, 8, 9, 11, 12 - sample 40 (depth 98-99 m), fig. 6, 7 - sample 34 (depth 104.1-104.6 m); the Chut River, outcrop 7, sample 0': fig. 5, 10. Fig. 1, 2. Acritarcha (?) sp.501, FF-P002/501-08922: 1 - (bar=23µm), 2 - detail (=10µm). Fig. 3-5. Acritarcha (?) sp.502: 3, 4 - FF-P002/502-08927, 3 - (=30µm), 4 - detail (=10µm); 5 - FF-P002/502-12306 (=23µm). Fig. 6, 7. Acritarcha (?) sp.503, FF-P002/503-04603, 7 - (=50µm), 7 - detail (=10µm). Fig. 8, 9. Acritarcha (?) sp.504, FF-P002/504-08924, 8 - (=23µm), 9 - detail (=10µm). Fig. 10-12. Acritarcha (?) sp.505: 10 - FF-P002/505-12309 (=32µm); 11, 12 - FF-P002/505-09003, 11 - (=45µm), 12 - detail (=10µm).